The White Wolf Mountain Dungeon is used mainly in the Heroes Quest, when you need to obtain Ice Gloves from the Ice Queen so that you can pick up the Firebird Feather. This is also Vanilla Ice's favorite dungeon! The dungeon itself is located below White Wolf Mountain. In order to get to the dungeon you'll need two things, a pickaxe and a mining level of 50. You already have a pickaxe in your toolbelt, but if you'd like to bring a higher leveled one, you can. You will also, of course, need food to survive in the dungeon, especially if you're a medium-leveled player. 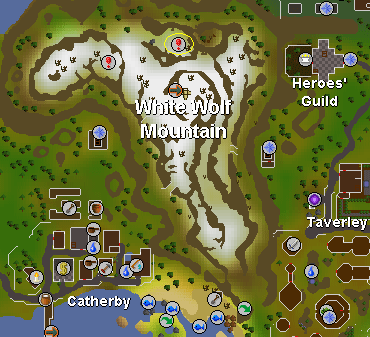 White Wolf Mountain is situated East of Seers' Village, and the dungeon can be found north of the Gnome Glider ( ) on the mountain. You need to mine away the rocks to get to the first three ladders leading into the dungeon, and there are two level 78 Ice Warriors guarding the ladders and they will attack you together. You can take three ladders but it is advised you to take the Southern one, you'll read more about this later. Inside the dungeon you'll notice that there are many ladders and three paths to take. There is only one path that really leads you somewhere and the other other ones just take you out of the dungeon. I will briefly tell you where the ladders lead you. This ladder brings you to a small place with two level 78 Ice Warriors. You can use these to train on because no one ever goes there. You'll notice there is one ladder. It'll lead you out of the the dungeon and to a safe spot on White Wolf Mountain. You won't be able to enter the mountain through that same trapdoor. This ladder will take you nowhere really, you'll end up in a small area surrounded by a fence. There is only one Ice Warrior and a ladder, this will lead you out of the dungeon as well, just a little west of the other ladder leading you out of the dungeon. 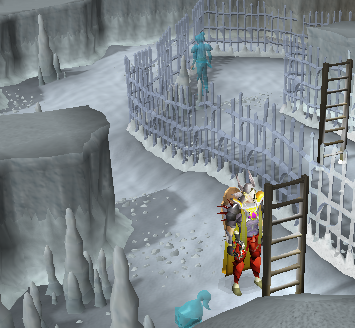 This ladder will give you two options, you can go North to train on three Ice Warriors or you can go southeast to more ladders. 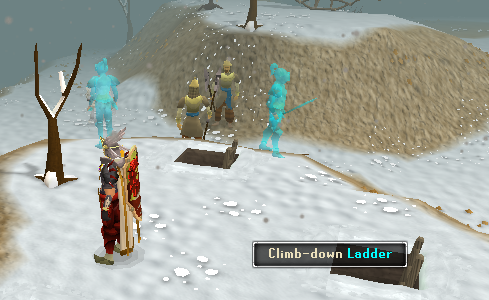 When you go to the other ladders you'll probably be attacked by ice warriors again. 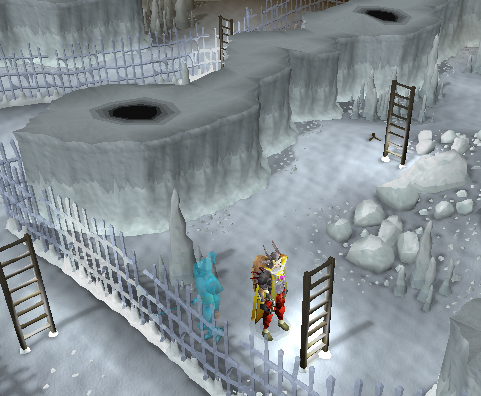 Once you read the ladder you can climb up and you'll be on a small area with four level 74 Ice Giants, this is a good area to train for medium leveled players, there is also a spot where you can mange or range them. 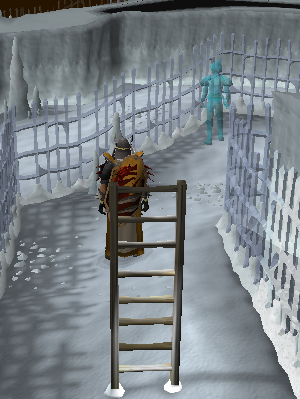 When you first climb up the ladder leading to the ice giants you'll notice two more ladders, the Northern ladder will only take you to another room with two Ice Spiders and a ladder taking you out of the dungeon. The Eastern ladder will take you to a long path where you'll have to face seven Ice Spiders and six Ice Giants, but they are spread along the path and won't attack together. The spiders do tend to follow you and attack you for a long time. When you followed the path all the way you'll end up at another ladder, climb up this ladder and you'll end up on a very small area where you can have a rest to restore your energy and Life Points. 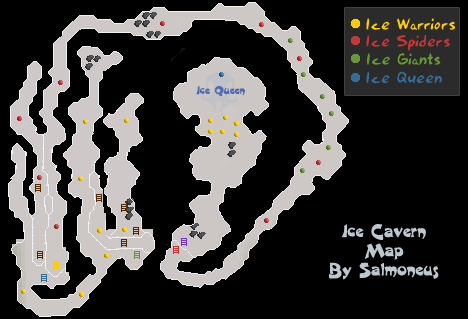 When you think you're ready to go you can climb down the other ladder and walk North, this is where the Ice Queen is situated along with six Ice Warriors who will all fight you together if you come close. 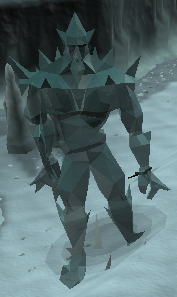 You can easily run past them and when you reach the ice throne of the queen they won't attack you, make sure you stand next to it or north because they will still attack you if you are in front of it. Now you can kill the Ice Queen. She is level 110. 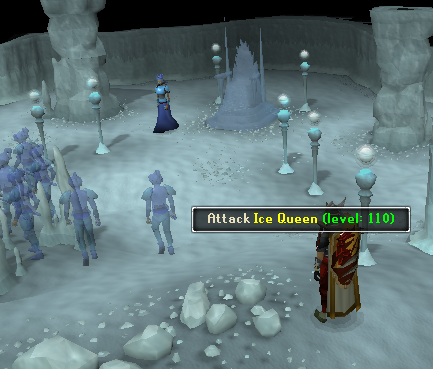 The Ice Queen has a strong defence against melee and ranged but weak to fire spells. She will drop ice gloves need for the Heroes Quest and the final boss fight of Recipe for Disaster. 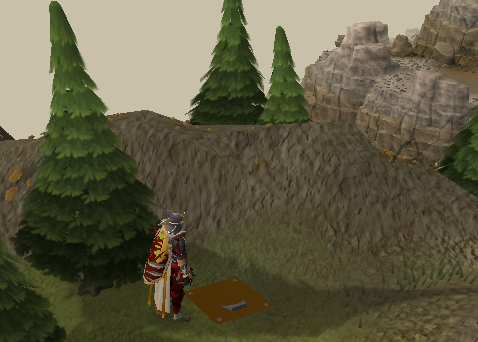 Warning: they are invisible on the map on RuneScape!